I like compliments, but sometimes they're tricky. To be fair towards us men: Sometimes we think you're both. The issue may also be that Connie and anyone with good sense wouldn't want to associate with somebody who tells people that they look "exotic", no matter whether they find "exotic" attractive or not. Exotic, like a Llama or an Emu? 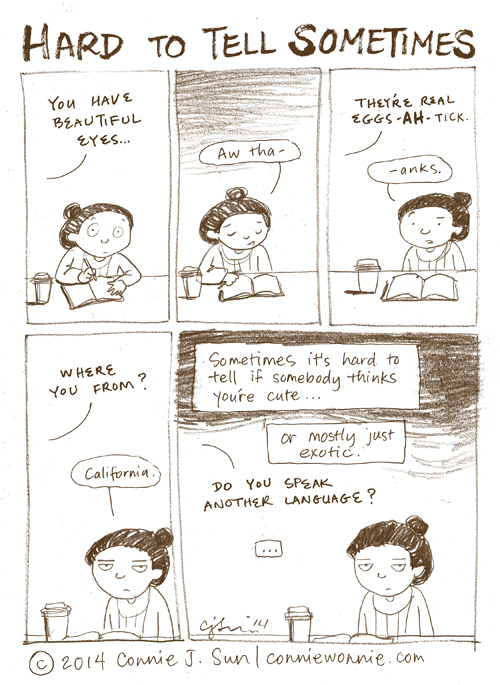 You'd think with such diversity in America (and particularly CA and NY), people wouldn't need to use "exotic" to describe someone's eyes. "May I just say your eyes look really cute when you're looking at me with utter contempt?"